The Chippewa Valley’s newest craft brewery and taproom opened Friday, July 7. 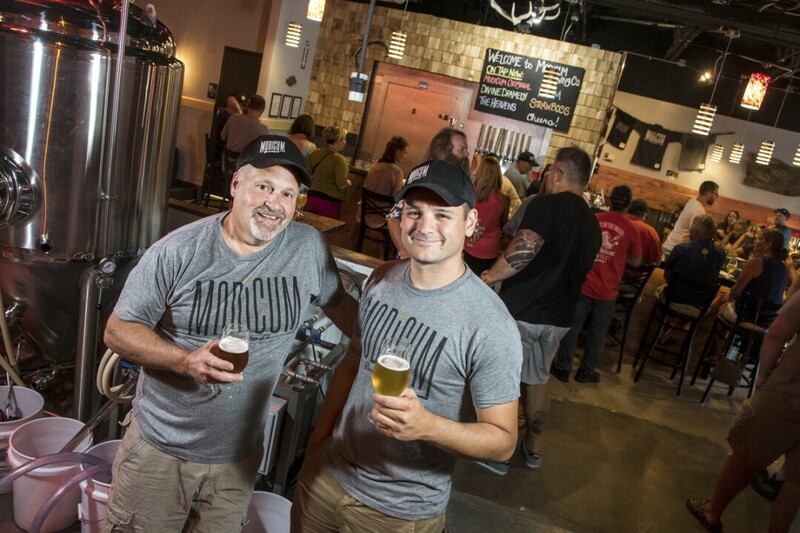 Modicum Brewing, headed up by Mike Blodgett and brewmaster Eric Rykal (above), is nestled into the west side of Altoona (3732 Spooner Ave. Suite A). Do you want a lot of a mediocre thing? Or would you prefer the perfect amount of something magical? If you selected the latter option, then you should swing by the newly opened Modicum Brewing in Altoona. They are changing the landscape of beer culture. 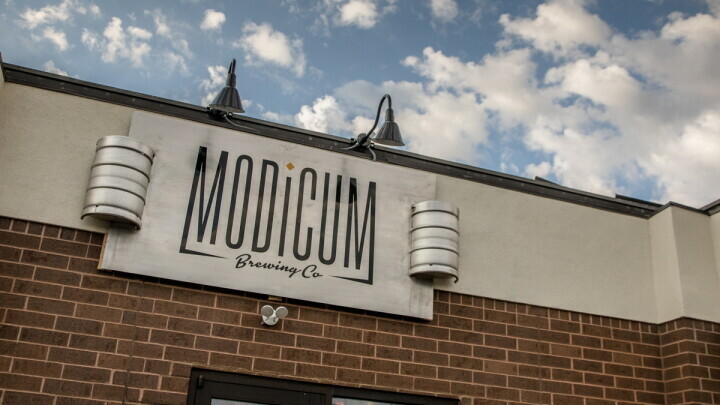 Modicum is a taproom that brews on-site which means it’s almost impossible to find fresher beer. Another thing that sets their beers apart is the commitment to balance. Each batch is meticulously crafted and cared for throughout the fermentation and maturation process. If that isn’t enough, all of their hops are sourced from Wisconsin. The rest of their ingredients are from Wisconsin, unless they're impossible to get in the state. Either way, you can taste Wisconsin with every sip. Modicum’s recent grand opening celebration saw five specialty ales on tap, but they plan to take their selection to 10 unique brews sooner than you think. 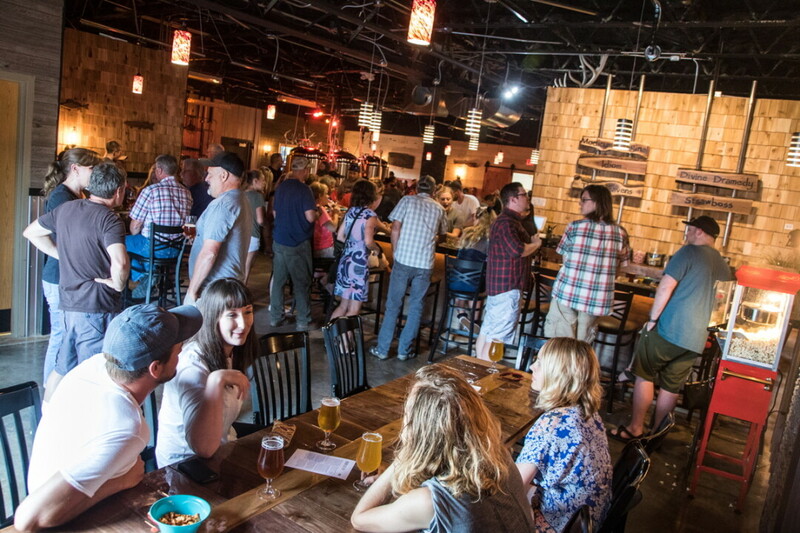 The taproom itself has a cool atmosphere with locally harvested timber, which makes for a warm and inviting gathering place. If you can’t find a place to sit at the 40-foot bar, there is seating galore and even a spacious party room. Co-owner and master brewer Eric Rykal plans on hosting beer school classes, but the possibilities are endless. Rykal and his business partner, Mike Blodgett, are putting the craft back into craft beer. “Beer is a liquid art form,” Rykal said. “Liquid jazz.” Balance is their main ingredient, as their brews are always extra careful not to be overpowered by a single flavor. Starting with the freshest and most local ingredients, these beers are artistically combined, beautifully balanced, perfectly fermented, and masterfully matured. Alongside beer, they have partnered with local cheese curd, sausage, root beer, and roasted nut vendors. That in mind, the best thing to pair beer with is great conversation, and that’s the philosophy at Modicum Brewing. Drinkers who are accustomed to slugging down tasteless or overly bitter beer can open their minds and their mouths with these well-constructed recipes and beers that showcase complexity, subtlety, and nuance. Modicum Brewing turns beer into a high art form. If you go, and are somehow tasked with only trying one brew, I recommend “The Heavens.” It’s soft, crisp, and balanced. It is crafted with pils, carahell malt, spelt (a more nutritious and robust cousin of wheat), and hops from Mt. Hood. The heavens opened up, the angels sang, and I finally understood craft beer. Designated drivers can bring home a 750ml bottled brew to enjoy at their convenience, or patrons can utilize Eau Claire’s own Brew Hop, a beer bus that will start touring Modicum and tons of other local breweries. Modicum specifically has plans to not distribute to preserve the quality and integrity of their beverages, and keep their beers in house, on tap, and as uniquely wonderful as possible. The Chippewa Valley's newest craft brewer opened its doors on Friday, July 7. Modicum Brewing, headed up by brewmaster Eric Rykal and partner Mike Blodgett, is nestled into the west side of Altoona (3732 Spooner Ave. Suite A). Photos are from the brewery's soft opening on July 5.